The village church bell tolls. It’s 4:30 in Monterosso. Jim refuses to enter our little church here. “I’m afraid of churches,” he claims. (Those who know him understand the irony.) Jim’s yet to recover from his priest-scolding in Venice. Otherwise, we’re well rested and recuperated from the craziness of Venice. Before me the calm Ligurian Sea sparkles in the late afternoon light. An hour ago I dipped my feet into that ocean water and found it cool, but not icy like Oregon. The bidet works well to wash off stone and sand. I sit on a small balcony of our hotel, a wonderful little place run by Matteo and his wife Carla. Their children weave through the lobby, calling for Mama and Papa. Little Chiara helps me with a computer password. Young Giacomo digs into the paper supply behind the front desk either for a Kindergarten project or his own entertainment, I can’t tell. Forty minutes ago I sent Jim, his camera, and specific travel instructions south on the milk-run train. 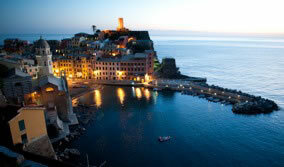 They’re all going to the next town of Vernazza for some twilight photos of that picture-postcard place. On our vacations, Jim takes photos and pays for stuff; I manage almost everything else. Having Jim go solo on a train is no small feat. I hope I see him again. The church bell clangs again, now 15 minutes later. Does this ring all night, and we never noticed? We must return here one day. 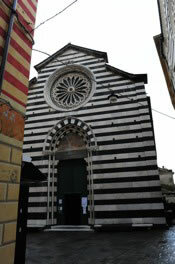 We’re making nice progress on our Italian train-travel learning-curve, beginning with our journey from Venice. 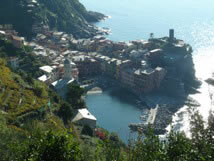 Our Milan connection was easier than we anticipated, but then we grew confused as we bounded south toward these Cinque Terre beach towns. The English recorded announcements failed to make our connection, apparently. Our train lumbered behind schedule and I grew uncertain of our location. We almost got off a stop early. Fortunately our train car contained some kindly Italians who helped keep us in line. The elegant 60-something lady next to me offered some homemade food she‘d brought along. I politely declined the mysterious napkin-wrapped morsel. When Jim tried to turn her down, she thrust the food back at him. So he took it. Inside the napkin, Jim discovered a delicious salami sandwich (I took a taste) and I regretted my Panini rejection. Later she passed me a piece of her daughter’s cinnamon bread. This time I accepted. Funny, I can’t imagine taking food from strangers on a train in the U.S. Italy does something to a person. 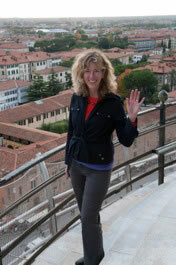 We did, however, take a couple of day trips to nearby Lucca and Pisa. 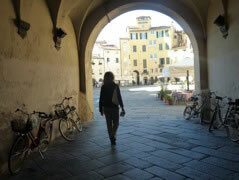 Lucca hasn’t made the tourist map. 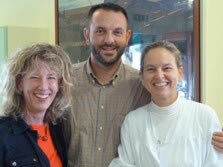 If you want to enjoy a delicious classic Italian town, Lucca‘s the place. The town retains its entire Renaissance wall and the locals use the top as a park-way for walking, jogging and riding bikes. We rented a tandem bike from a non-English speaker, a task which turned out to be easier than riding the tandem itself. Tandem matters weren’t helped by the fact that Jim had accidentally ordered more than just a single glass of wine at lunch, and he felt compelled to consume the entire half carafe. This wouldn’t have been a problem except he insisted on driving the tandem, and sober me had no brakes or steering in the back. 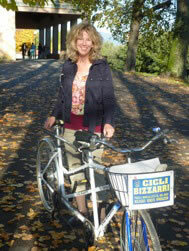 We nearly took out a couple of baby carriages while Jim yelled out “Buon giorno!” to Luccan passer-byers. (It was Jim’s idea for me to include this part. Jim was less thrilled about the idea of visiting touristy Pisa. Once we arrived, he was delighted to see a larger and more interesting tower than he’d envisioned. 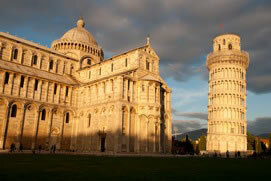 We visited the other sites of Pisa’s “Field of Miracles” before tackling the tower. 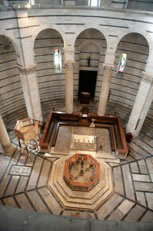 We were almost the only ones in the Baptistery, a 12th-century building with outstanding acoustics. Every half hour a security guard stands in the center and sings a few notes. The ten-second echo combines these notes into chords, and the chords become a tune. We thanked the guard on our way out and he smiled. Climbing the Tower came with instructions and warnings, including advisories for people who suffered from vertigo. Inwardly, I scoffed. Once inside, the tilt in the first floors of the tower was greater than we’d imagined. In sections, we felt like we were going downhill instead of up. 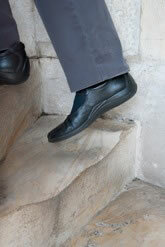 The stairs were worn from the millions of climbers over the centuries, the wear deeper on the downward angle of each step. At the halfway mark, guards scooted us outside for a view while the folks from the top scampered down the one-way staircase. During our turn at the top, we pinched ourselves for where we were, snapped photos and soon got escorted down by the non-singing guards. Jim and I were the last to linger at each level. These guards run a tight thirty-minute ship, but I guess they have to. Back here in Cinque Terre, we took one day to explore the towns by train, and another day to hike the rocky trails between. Today was hiking day. My feet ache a little (but in a happy way) from our 3.5 hours of tromping up and down spectacular ravines and hills overlooking the towns and sea. 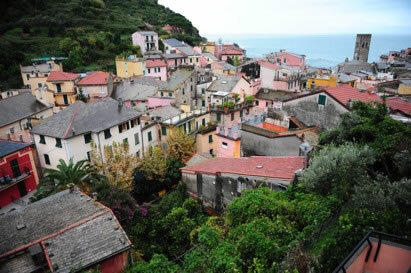 After our hike, we hopped the train in Corneglia for Monterosso. The tiny town of Corneglia (population 240) doesn’t employ a train ticket agent. “Purchase your tickets on the train,” a sign reads. We recalled warnings about failure to buy and validate train tickets. Stiff fines. Unmerciful conductors. Jim and I trolled the train’s cars during our twelve-minute ride, searching for the conductor, figuring we’d not be busted if we looked like we were looking. Finding ourselves in an empty coach, Jim suggested we walk back and forth there. For the last few minutes, we did just that. As we pulled into our station, our pacing, pivots and laughter caught the attention of a guy in the next car. He may have been the conductor, or he may have been somebody alarmed by our behavior. We’ll never know because we jumped from the train and scurried towards our beach-town. The last bit of light lingers over the sea. Children below laugh, scream and play in the piazza. Dogs bark. I know Jim is getting great photos. The church bell rings once, signaling 5:30.